Stet by Diana Athill was first published in 2000. She decided to write this book when she realised that when she died all of her memories would be erased. I’m glad she decided to share them although she has gone on to live another 18 years since this one was published and has written more books. This one is about how she became an editor and helped to found the publishing house Andre Deutsch. How they went about building up the business and the problems involved. It has to be said that for her the main problem seems to have been Andre Deutsch himself, and she does say that people have asked her over the years why she put up with being so badly treated by him. I suppose it was completely different times for women and she seems to have just felt very lucky to have a job that she enjoyed. However she was paid appallingly badly, considering that she was often hailed as the best editor in London. I suspect that she had a distaste of talking about money and pay rises. She mentions that in the 1970s she was only being paid around £10,000 a year and she never got more than £15,000. I happened to be living and working close to London in the 1970s and I was earning over £10,000 as a very lowly ‘librarian’ in the NHS. In part two of this book Athill has written individual chapters on some of her favourite Andre Deutsch writers. Mordecai Richler, Brain Moore, Jean Rhys, Alfred Chester, V.S. Naipaul and Molly Keene. She seems to have got very involved with them and their private lives. I’m not sure how normal this is for an editor. I suspect it’s only necessary when writers are quite chaotic, as they often are. I’ve come to realise that I’m usually better off not knowing a lot about authors I like as they’re often a disappointment to me in their personal lives. Gosh that makes me sound so judgemental and po-faced – but Jean Rhys in particular was a nightmare! It is a strange thing that quite a lot of female authors seem to have abandoned their children to almost strangers. Muriel Spark did that too and I know that Enid Blyton was interested in all children except her own, allegedly. 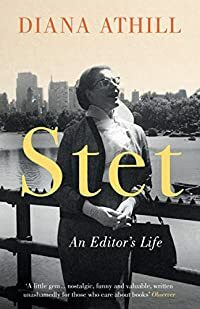 Anyway Stet is an interesting read although again Athill mentions Angela Thirkell as a writer that she really disliked. She says in this one that Thirkell is just embarrassing. I suspect that possibly this is because Athill’s sense of humour is very different from Thirkell’s. Or maybe she knew her and disliked her as a terrific snob, which she undoubtedly was, and also no great shakes as a mother either I think. Anyway, I’ve wandered as is often my wont. Stet is an interesting and enjoyable read. This entry was posted in Books and tagged Diana Athill, Stet by Katrina. Bookmark the permalink. As I’ve mentioned, this book has me intrigued. But I can’t understand why an editor would say they disliked an author without specifying why, exactly. What’s the point? I wonder. So you personally disliked them? Big deal, unless you say why. It’s as much as if to say the postal carrier disliked them. And, I guess, male writers don’t abandon their children because they have women and housekeepers to take care of them. There are so many male authors who had nothing whatever to do with their children, when young or when adult. But I know what you mean. It is off-putting when a woman is reported to have done it. But did they really? And after all, children may be better off with care-takers, neighbors, relatives, if the mother involved is as creatively crazy as many men are as well? It is strange that in at least two books she has singled Thirkell out as an author she dislikes, and as I recall she said in another book she dislikes the kind of women who read Thirkell’s books! I thought about men abandoning their children but it does seem a lot worse to me for a mother to do it as it’s always their decision about having the child in the first place. Lots of men do say that although they might have left their wives, they didn’t choose to leave their children, they’re just unlikely to get custody. There are some mothers that just never should have had any children, but even if nannies or relatives take over the care and do a much better job of it, the sense of abandonment and neglect is always with the children I think. Muriel Spark was awful to her poor son, even accusing him of trying to enhance his art career buy using the surname Spark, which was after all his name and his father’s name. Most parents would support a child in their career – not put them down. Now that is koo-koo crazy–an editor disliking the readers of books authored by a person the editor dislikes. Ridiculous. And just absurdly ludicrous to admit it in print. I’ve never read Spark. Have you?? I think you must have, of course. Do you have one you would recommend? I have The Philosopher’s Son on my list, but I don’t really know. I should do more research. I’ve read quite a lot of Muriel Spark’s books, some are good and – others are not, in fact some were apparently written when she was on drugs (I think to suppress appetite), delusional and seeing things!